Eileen Karmy Bolton is in the first year of her PhD researching organized musicians in Chile between 1953 and 1973, under the supervision of Martin Cloonan and Eva Moreda Rodríguez. Prior to coming to Glasgow, she worked as a researcher of popular music in Chile for several years. In 2014 she co-edited Palimpsestos sonoros. Reflexiones sobre la Nueva Canción Chilena. Tuesday 15th December 2015 saw the launch of the research project Musical Memory of Valparaíso [Memoria Musical de Valparaíso] co-authored by Cristian Molina and myself with funding from the Fondo de la Música Nacional [Council for the Promotion of National Music] (CNCA 2015). The launch took place at the Library Santiago Severín of Valparaíso, Chile, and was attended by more than 50 people. Among the presenters was the current Secretary of the Musicians’ Union of Valparaíso [Sindicato Profesional de Músicos de Valparaíso], Félix Gutiérrez, who spoke movingly about the relevance of the project. More specifically, he highlighted the efforts of the authors to make the history of this Musicians’ Union visible and he shared his appreciation of the historical documents of the Musical Society of Mutual Aid in Valparaíso. My colleague and I briefly stated the aims of this project and explained that the first stage of the project, developed throughout 2015, was devoted to researching history of the organised musicians in Valparaíso by the late 19th and early 20th centuries. At this time, this port-city was an important commercial centre, and the working conditions of musicians were very similar to those of skill and craft workers The research relied heavily on the digitization and analysis of the documents of the Musical Society of Mutual Aid. 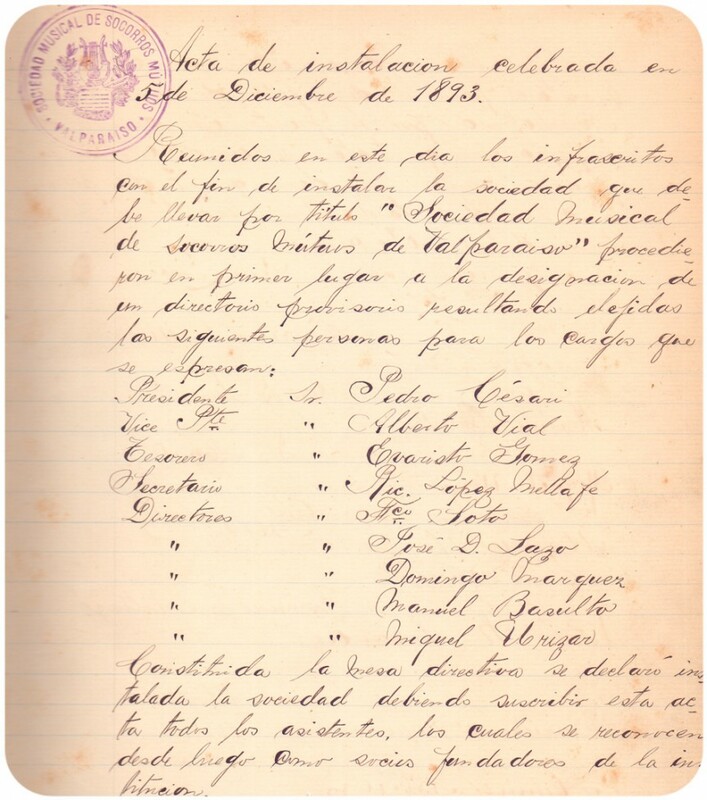 Ours was the very first examination of these documents which contain the history of the organization and are held in the Musicians’ Union´s office and date back from between 1893 to the mid-20th century. The archive includes different kinds of holdings, such as minutes of meetings, particularly manuscripts written by its members, letters between the members and the Society, letters between non-associated musicians and the Society, and letters between the Society and contemporary organisations. Other documents include the internal accounts, leaflets as information and propaganda about the raising labour movement in the country. We then introduced the website, created with the purpose of disseminating the research. It is freely accessible, with more than 70 digitized images, as well as reviews about different issues concerning the organised musicians of the time. The information is organised by years and it is available in different sections throughout the website. In the section called Proyecto [Project] you can read about the aims of the research and find a profile of the researchers. Under Reseñas [Reviews] you can find several reviews about the research developed as part of this project. 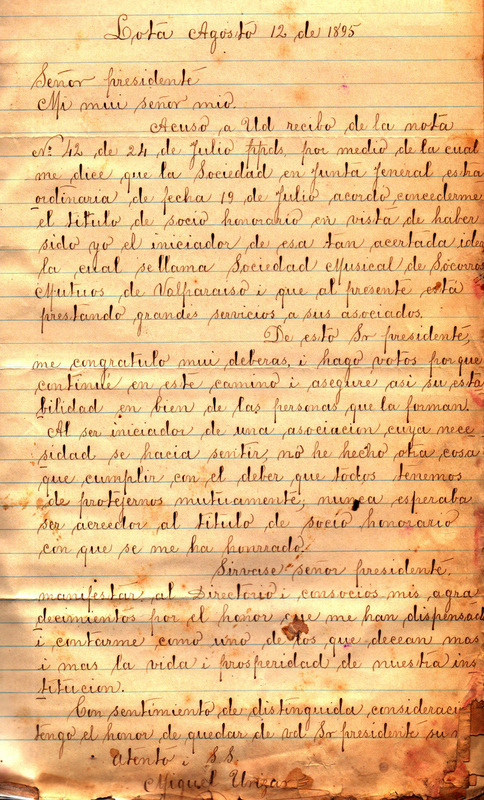 Here you will be able to read essays, biographies, and reports about the organised musicians of Valparaíso. 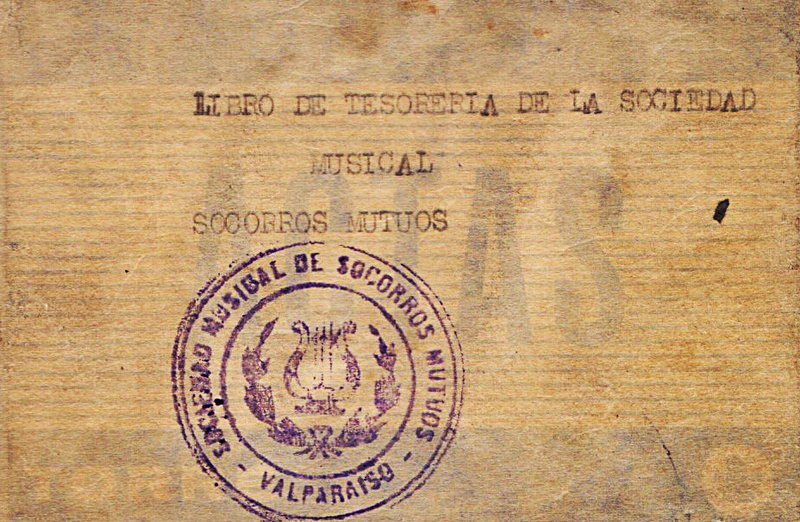 Meanwhile under Galería [Gallery] you can see a selection of the images that have been digitized from the archives of the Musical Society of Mutual Aid in Valparaíso [Sociedad Musical de Socorros Mutuos]. And under Noticias [News] you can read the last information related to the project, such as interviews, reports and conferences. 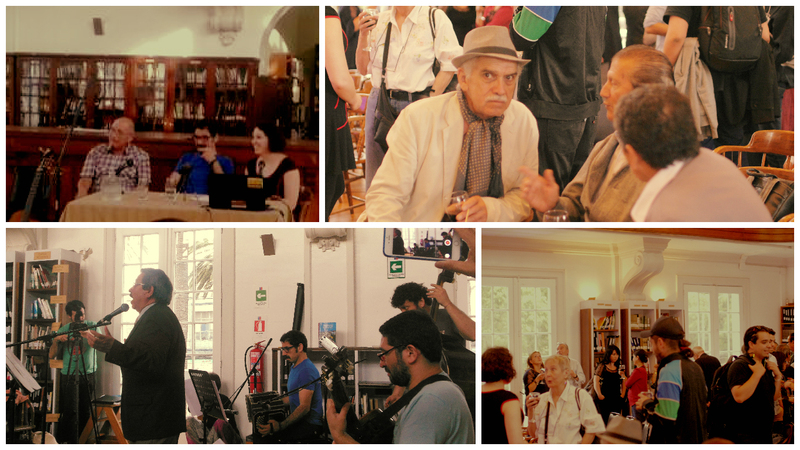 To finalise the launch, we had some live music with the tango orchestra co-directed by Rodrigo Ugarte and Edgard Ugarte. The member of the Musician’s Union and singer of Valparaíso, Raúl Guerra, sang well-known tangos with this orchestra. Among the public who attended this release, we would like to give our special thanks to Pedro Álvarez, who, together with the late President of the Musicians’ Union, Juan Odales, trusted our project and opened the doors of the organisation for us, from 2012, allowing us to outline what this research would become. Finally, we shared some wine and pleasant conversation with students, musicians, journalists, members of the Musicians’ Union and other organisations from Valparaíso who attended to this activity. This project has been recently selected by the Fondo de la Música Nacional, which will allow us to continue our research during 2016. We will be focusing on the archives of the Musicians’ Union of Valparaíso [Sindicato Profesional de Músicos de Valparaíso], founded in 1931.